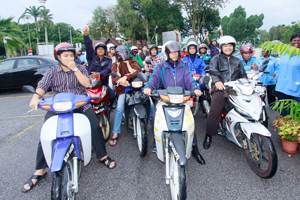 BANGI, 12 Dec 2012 – A surprising number of road users, the majority being motocycle riders, do not have road tax for their vehicles nor driving licences and insurance when they are on the road. The CEO of Allianz General Insurance Company (Malaysia) Berhad, Encik Zakri Khir said quite a number of them also do not adhere to safety rules especially among youths riding motocycles. Speaking at The National University of Malaysia (UKM) and Allianz Malaysia Road Safety Campaignat the Faculty of Engineering and Built Environment (FKAB) today, he said some do not even knowhow dangerous it is to drive or ride without adhering to the highway code. Motorcyclists have the highest road fatality rate in the country and realising this, UKM is advocating road safety within the campus to instill the desire among its students to adhere to safety and traffic regulations. Zakrisaid many UKM students riding motorcycles within the campus, weave their way in and out of other road users without realising the risks they take when riding nor has the dangers been fullyexplained to them. He hoped the campaign can inculcatereadiness among the students to care for their own safetyand to be more cautious when on the roadso that they will do more to protect themselves and others by obeying the rules to avoid serious accidents. Zakri said of the 18 to 20 deaths on average from accidents each day, 60%are motorcyclistswith most of them being youths. He hoped that students will heed safety requirements so as not to be among the statistics. Deputy Vice Chancellor (Industry and Community Partnership), Prof Dato’ Dr. Saran Kaur Gill and Encik Zakri Khir later presented prizes to winners of the Allianz Drive Master gameand presented wind breakers, safety helmets and child booster seats to lucky draw winners.